During a presentation at this year's Serious Games Summit in San Francisco, Santiago Siri unveiled a powerful new tool set. Based on his ideas of interactive storytelling, Siri has created some fantastic software, though still in the prototype phase, which is intended to make the experience more realistic and dynamic. 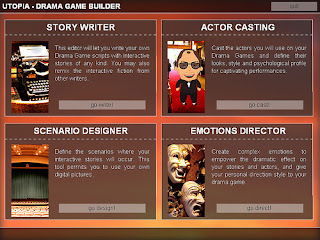 The Utopia tool set, now renamed Playdreamer, consists of four parts which are used together to create interactive stories. However, due to some of the old associations with the term "interactive story," Siri is now using Patrick Dugan's term "drama games." This is also due in part to the word "drama" implying the idea of "art." Thus, the new drama games may also fall under the term art games. A video of the SGS presentation is available here. What's more, Playdreamer is a free open source project, the prototype version of which is already available at its site. The availability of this, which is intended to be easy to use for anyone, is bound to bring us some very interesting media. And that's exciting. To quote Rod Humble from a recent comment, I too believe that "what is really pleasant is the springing up of people around the world who are interested in making a new art form unique to games. I believe we are entering a wonderful time."